Baltimore’s parks offer city residents and visitors a wealth of recreational, historic, and cultural opportunities. Many city parks have playgrounds and sports courts, and some feature public pools. Whether the goal is a quiet picnic, Frisbee throwing, or a simple walk, Baltimore parks are a fun and free experience. Before 1860, Baltimore had only two parks – Patterson Park and Federal Hill Park. As the city grew in both population and wealth, its citizens sought to create more open spaces for recreation and public health. The city and its parks board bought or were given seven large estates that now anchor Baltimore’s parks system. Notable parks and green spaces include the Cylburn Arboretum, which boasts 173 acres of formal and woodland gardens and trails. South of the arboretum is Druid Hill Park, a 745-acre urban oasis and home to the Rawlings Conservatory and Botanic Gardens. Three greenways—Gwynns Falls, Jones Falls, and Herring Run—make connections between the city’s parks and neighborhoods and provide additional opportunities for hiking and biking. Many of the city’s best-known parks are also sites of significant War of 1812 history. Five scenic parks bore witness to key events of the War of 1812 and the September 1814 Battle of Baltimore. Interpretive signage at the parks, created by the National Park Service as part of the Star-Spangled Banner National Historic Trail, provides historic context and a glimpse into the past. Expansive Patterson Park lies northeast of Fell’s Point. A defensive line of earthworks ran through the park to defend the city against a ground attack by British troops. 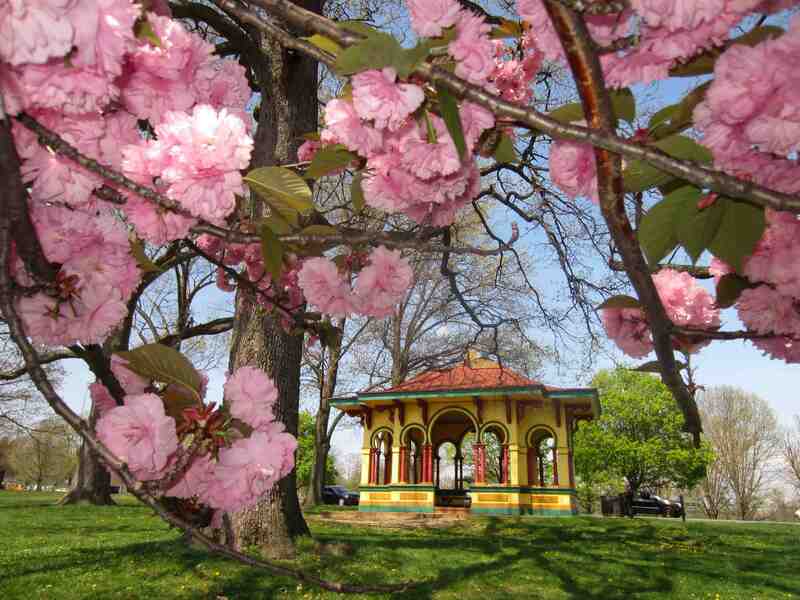 Hampstead Hill, where the Patterson Park Pagoda stands, offers a commanding view of the park from the site of the former defenses. As a high point at the Inner Harbor, Federal Hill served as an observation post and signal station during the war. A one-gun battery on the hill sounded alerts to the city. When the British bombarded Fort McHenry, many citizens watched from the hill. Today several monuments stand in the park in honor of War of 1812 heroes, including Lt. Col. George Armistead and Maj. Gen. Samuel Smith. Riverside Park in South Baltimore was once the site of Fort Lookout, an observation post that peered over the water at the British fleet. Today a cannon memorial and a National Park Service interpretive sign recognize the park’s history. Carroll Park in west Baltimore was once an active plantation. The Mount Clare Mansion on the park’s grounds was the home of James Carroll, Jr., an American militiaman. In August 1814, the Maryland militia marched past the house on their way to face the British at Bladensburg. Both the burning of Washington, DC and the bombardment of Fort McHenry could have been seen from the home’s second-story windows. Baltimore merchant Henry Thompson’s estate is now Clifton Park. Thompson led the First Baltimore Horse Artillery, which served as the personal guard for Maj. Gen. Samuel Smith, the commander of the American forces in Baltimore. Philanthropist Johns Hopkins purchased the estate after Thompson’s death and transformed Thompson’s modest farmhouse into the Italianate villa that stands in Clifton Park today.